(iv) Extensively hydrolyzed milk – Not commercially available in some countries, on prescription, whereby the milk protein is extensively broken down to protein size of less than 3kD. 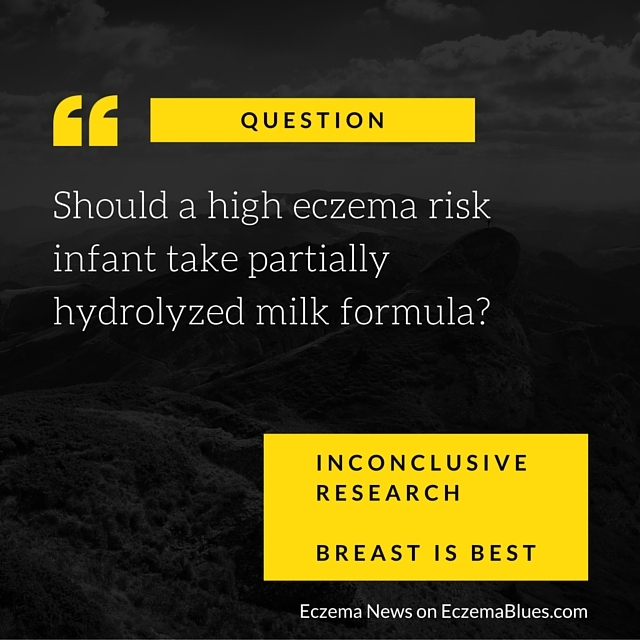 The Key Question is whether partially hydrolyzed milk protein is effective in preventing eczema. This is often examined alongside the questions of (i) whether it is cost effective to be put on hydrolyzed formula and (ii) inferior nutritional value of hydrolyzed formula. Let’s examine the research on whether partially hydrolyzed milk protein is effective in eczema prevention. I have briefly looked into this in 2011 (post) and the research then showed that partially hydrolyzed milk is recommended for high-risk babies but not if there is a proven milk allergy. For those interested in learning more about hydrolyzed formula, refer to FDA archived presentation. In 2013 (post), research’s recommendation was for high-risk infants who cannot be 100% breast-fed, partially hydrolyzed milk is recommended. In a paper published in Clinical and Translational Allergy, Partially hydrolysed, prebiotic supplemented whey formula for the prevention of allergic manifestations in high risk infants: a multicentre double-blind randomised controlled trial, it was found that there was no preventive effect to early feeding with a partially hydrolyzed formula with added prebiotics. In a paper published in the Expert Review of Clinical Immunology, The Role of Partially Hydrolyzed Whey Formula for the Prevention of Allergic Disease, authors warned that due to limitations on studies on partially hydrolyzed milk, the recommendation should still be ‘breast is best’. In a paper published in the Annals of Nutrition and Metabolism, Cost-Effectiveness of Partially Hydrolyzed Whey Protein Formula in the Primary Prevention of Atopic Dermatitis in High-Risk Urban Infants in Southeast Asia, the finding was that overall costs (even after including the cost of milk formula) of taking partially hydrolyzed formula (as opposed to cow’s milk formula) for high-risk infants would be lower than the costs of managing eczema. It seems though that partially hydrolyzed milk formula is in practice recommended by doctors due to cow’s milk being the most common food allergen in infants. Research wise, there has yet to be a conclusion due to difficulty of conducting unbiased studies with sufficient (mother and baby) participants. What’s your experience in this? Do share in the comments! We found Holle infant goat milk formula had the best result with our daughter. Thanks for sharing! I tried goat’s milk too but didn’t see any effect but turned out she’s not allergic to anything. Good thing milk is not something my daughter likes, started eating healthy veg,fruits and squash from 9 months old. Have a good weekend! That’s good! Ours is more fussy but we are in the process now of weaning her off it. @SarahjChapman – a guest of this blog has shared on twitter that the salt content of milk formula has been reduced since 1970s. I checked various websites and Pubmed, and some websites stated that the salt content of formula milk is similar to that of breast milk while others stated that cow’s milk formula is high in salt. I couldn’t find a study on this, so please read the label of your infant formula and compare the salt content across brands. The decision of what formula to give is based on the reason why you’d need an alternative to breast milk and after discussion with your doctor – it’s unlikely to be based solely on salt but it’s always good to be mindful of salt content because the research that I come across all state that for children who were given more salt when young, they also tended to take more salty food when older.